The first Wild Ethnobotany guided hike was, despite the -30 degree windchill, an absolute success with a dozen brave souls venturing out to join me as we walked the snowy, windswept trails of Princess Point along Cootes Paradise. We sampled highbush cranberries, European black alder catkins and staghorn sumac berries, learned about the life cycles and medicinal properties of burdock and motherwort as well as received a lecture on the significance of oak savannah (one of the most endangered culturally modified ecosystems in the world) and how the historical land use practices of North America’s first people provide examples in ecology and community planning and for building sustainable and human-friendly landscapes in the future. Thank you so so much to all those that helped spread the word of the event, the venues who tolerated my flyers and of course those that came out to hear me talk! You have proven yourselves to be the hardiest of the bunch. The theme for this hike will be observing species as they transition from late winter into spring. The sun’s heat and thawing soil stimulates a multitude of biological processes which will prepare each individual species for the demands that must be met during the coming growing season. We will even come across at least one species that is famed (among plant enthusiasts, that is) for often being the very first native plant to bloom in southern Ontario, a plant that has a rich and wonderful cultural history with many lessons in ecology to teach and perfectly demonstrates the evolutionary brilliance of the plant kingdom. This however is most definitely an exception to the majority of plants which will still appear as though entirely still within their winter hibernation, although this is the last month until perhaps November or December when these species may be observed in this state. A suggested donation of $10 to help cover the costs associated with advertising and preparation for this hike would be greatly appreciated but no one interested in learning will be turned down due to a lack of funds. Although I’m hoping the weather in March will be pretty tame by the 29th, I still recommend wearing appropriately warm/dry clothing, bringing along a nice hot beverage, some snacks if you feel inclined and suitable footwear as the trails may be icy, snow covered or unbearably muddy and slippery depending on the weather leading up to the event. If you would like to know something else (anything at all) before the hike date or to RSVP (which really helps me so please take a minute to if you can!) then please send a message to tomnagy@outsidethehops.com. 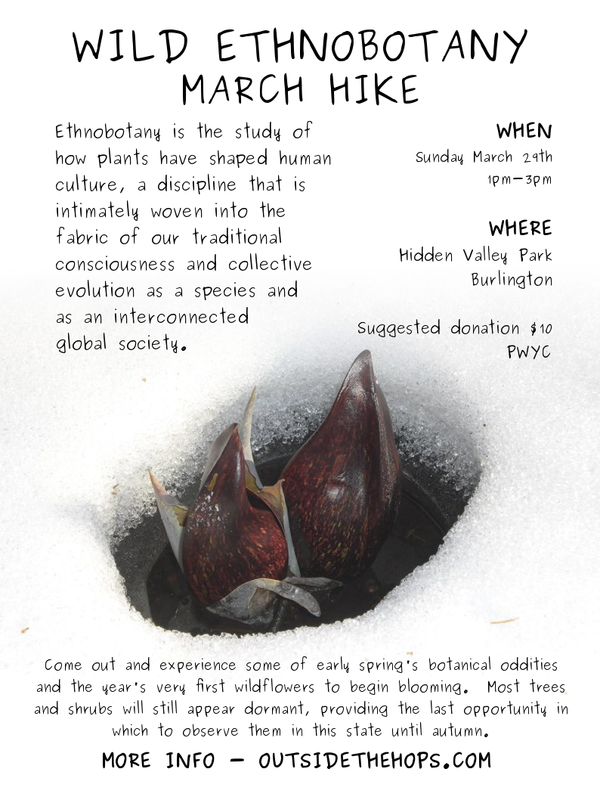 I would also like to thank James Franze, a fellow plant enthusiast who has taken the time to design this month’s poster featuring the species that I briefly discussed above that shall be one of the focuses of this month’s hike. Thanks James for all of your diligence, encouragement and support. I definitely wouldn’t have gotten on the ball as quickly as I did without your assistance.